We have all heard how wine consumption in the U.S. has risen. I previously posted about this wine consumption increase, noting how the average person drinks only about 14 bottles of wine a year. Some more specific statistics have now been published. The Press Democrat has published a new article giving more details. In 2007, the U.S. purchased 314 million cases of wine, up 4% from the prior year. How does this break down between domestic and imported wines? California wines are still #1, selling about 192 million cases or roughly 60% of the total amount of wines. But their sales only increased 2% since 2006. So there has been slow growth. Sales of wines from other states increased 3%, a total of 25 million cases. The largest growth though was in imported wines, which increased 9% from 2006. The article states that one of the primary reasons for the increased number of import sales may be the willingness of millenials to experiment with imported wines. For millenials, 4 out of 10 of their wine purchases were imports. This obviously indicates that domestic wines need to target more of their marketing toward millenials, to give them reasons to drink domestic rather than imported wines. Interestingly, U.S. wineries exported about 18 million cases, mostly to Europe. This is an increase but still less than 10% of the wines produced in the U.S. It seems like the U.S. could do more to market and sell their wines overseas. As I recently mentioned, L'Andana is now open for lunch. I stopped by this week to check it out, and see if lunch would be as good as dinner. And I was not disappointed at all. The lunch menu (which is probably subject to change as they adjust for lunch) has plenty of choices. You can start with a Primi, including small salads, tuna tartare or soup ($7-12). They had three sandwiches, including a BLT (with Pancetta), Open-Faced Panino (with Prosciutto & Mozzarella) or a 10oz Burger ($12-14). The Sandwiches come with french fries. There are 4 Entree Salads, frm Chicken Caesar to Watercress ($12-15). There are five different Pasta dishes, similar to what they have at dinner ($12-15). You can also order a Chicken Milanese ($17), similar to their dinner Veal Milanese. There are three wood-grilled entrees, including Swordfish, Chicken and Ribeye ($17-19). You can even get an order of their Truffle-Parmesan fries ($7). It was very quiet on the day we dined there as word about their lunch has not spread yet. Prior to our food arriving, we received their usual warm bread with oil and tomatoes. This is delicious bread though it can be filling. And they are quite willing to bring you more if you want. I was curious whether they would offer their bread for lunch or not and I am very glad that they did. We ordered some fresh-brewed iced tea (which comes in Green, Black and Crimson Berry flavors). We tried the Green and Black and both were excellent. Though iced tea costs $4, you get a bottomless cup. For someone like me, I can easily drink 4-5 glasses of iced tea. To start our meal, we split an order of Maccheroncelli ($15), American Wagyu meatballs and pasta in a Chianti sauce with Parmesan. I have had this before and enjoyed it very much. We each received two meatballs with our pasta. And it was as tasty now as it was before. The Chianti sauce is especially compelling, almost like a gravy with a touch of sweetness. The home-made pasta was cooked perfectly and the meatballs were good-sized, moist and flavorful. For entrees, we tried the Grilled Swordfish ($17) and the Chicken Milanese ($17). The Swordfish was a good-sized piece of fish, topped by a mound of grilled peppers and onions. The fish was fresh and flavorful, white and tender. And the veggies were excellent too. The Chicken was topped with argula, cured tomato and shaved parmesan. It was a large, thin piece of breaded chicken that was very tender. It was large enough that some people might have difficulty finishing it. The breading is very light, almost panko-like. We did have the Truffle fries as well, and they were as crispy and addictive as always. Overall, this was a delicious lunch from a restaurant that is excelling at what it does. Prices are reasonable for the quality and quantity you receive. They are comparable to the prices for lunch at the Capital Grille. You certainly have plenty of menu options for lunch, including some of their superb pasta dishes. Service was excellent without being overbearing. I will certainly return there for lunch, and look forward to their new Sunday brunch that will begin on February 10. Saké Month ends today. During this past month, I have tried to educate people about Saké, to clear up some misconceptions about this wonderful beverage. I have provided a number of Saké reviews as well as additional resources where you can go for more information. I have even posted some amusing facts about Saké, such as how some people drink Saké from half of a hairy crab. I have received some positive comments about these Saké posts, which is always good to hear. Though Saké month is ending, this is not the end of my posts about Saké. I will continue to post about Saké, about all different aspects of it. I may start a weekly Saké post, maybe creating "Saké Sunday," a special day each week for such posts. I greatly enjoy Saké so it is always a pleasure to write about it, to share my experiences with it. And there is much more to say about Saké, many more bottles to review. I also still need to get to New York City to visit Sakaya. As I look back over this past month, I ran a poll on Saké consumption, asking whether people had ever tried chilled Saké and if they enjoyed it. Over half of the respondents had never tried chilled Saké before. Most of those who had tried chilled Saké before enjoyed it. So, one of my goals this month was to try to get people, who had never it before, to take a chance and taste a chilled Saké. I even ran a contest this month, to get people to try chilled Saké and then review it. The winner was to receive two Saké books. Unfortunately, no one participated in the contest. That obviously disappoints me and I view Saké month as a partial failure. I had hoped to entice at least a few people into trying Saké but it appears I was unsuccessful. I will keep trying though as I firmly believe that more people would enjoy chilled Saké if only they would try it, if they would give it a chance. Forget your preconceptions about Saké and approach it with an open mind. What have you got to lose? The Wine Shop of Reading will a special Super Bowl Tasting this Saturday, February 2, from 3-5 pm. If you can't be at the Big Game then let the Wine Shop help you catch the spirit. Wear your Patriots gear! Plus Great Give-Aways! Throughout the tasting we will randomly shower you with some free cool stuff like hats, wine accessories, glasses, and Wine Shop goody bags. No purchase required to win. Here are a few short, miscellaneous items about Saké. What is the etymology of the word "Saké?" It seems that the original root word may be "sakaeru" which roughly translates as "to prosper, to flourish or to thrive." There is another theory though that the root word is actually "sakeru" which means "to avoid." This may be as Saké is supposed to help you avoid colds. Interestingly, Saké was also once referred to as kushi which translates as "something mysterious or strange." Kushi no Kami is an old name for the god of Saké. Here are several sayings about Saké. You can note that moderation seems to be considered important, that too much Saké can cause problems. "It is the man who drinks the first bottle of Saké; then the second bottle drinks the first, and finally it is the Saké that drinks the man." Sometimes when you are checking out the Saké selections at a local wine store, you might see a bottle labeled "Shochu." Shochu is not a type of Saké though it is sometimes made from rice. Shochu is a distilled liquor with about a 25% alcohol content. Shochu can undergo a single distillation or multiple ones. It is often clear in color, like vodka. It can be drank straight or mixed into a cocktail. Also like vodka, Shochu can be made from numerous different ingredients including barley, sweet potatoes, brown sugar and buckwheat. Barley though is most commonly used though sweet potato is very popular too. Dependent on its ingredients and how it is made, Shochu can have a wide range of flavors. It has become very popular in Japan, surpassing the popularity of Saké there. This popularity has led to the production or more artisanal and high-end Shochu. Shochu is making its entry into the U.S. market though it is slow. You might see one or two brands, if even that, at most wine stores. It is available in some bars and restaurants as well, though usually only the better Japanese restaurants. I have very little experience with Shochu so cannot personally say much about it. Though it is on my to-do list for the future, to taste more Shochu. If I do, I will of course report back my findings. About two weeks ago, I learned in the Boston Herald newspaper about two local entrepeneurs, Kevin Beardsley and Steve Diforio, who created a high-end Brazilian Cachaça, Beija. Cachaça is often referred as a Brazilian rum. It is the national spirit of Brazil and the third most consumed spirit in the world. As I am a relative new convert to the joys of Cachaça, I was intrigued by the article. I exchanged a few emails with Kevin Beardsley and he invited me out to taste some cocktails using the Beija. So last week, I stopped by the Vintage Lounge and met both Kevin and Steve. I spent some time chatting with them while tasting a number of different cocktails prepared and created by Alison and Bobby, two of the bartenders at the Vintage Lounge. Beija Corp. is a Boston-based company, founded by two young entrepreneurs: Kevin Beardsley and Steve Diforio. They saw potential in Cachaça but felt that most Cachaça was too harsh for American palates. So they decided to create a new Cachaça, something much smoother that would appeal to Americans. They spent time in Brazil, carefully selecting growers and producers who could follow the guidelines they had devised. Cachaça is made from sugarcane juice. Traditional rum though is usually produced from molasses, a derivative of the sugar production process. As sugarcane is used for both, Cachaça is sometimes referred to as Brazilian rum or sugarcane rum. For Beija, the sugarcane is hand-harvested, pressed and small-batch distilled within ten hours of harvesting. Other brands allow their sugarcane to sit in the sun for days before being distilled. By waiting that long, some of the sugarcane deterioates and you lose some of the intensity of the fresher sugarcane. Beija also undergoes only a single distillation, which helps preserve the natural cane flavor. Other brands may double-distill their Cachaça because they need to do so to smooth it out, but at the expense of some of the flavor. Kevin and Steve's restrictive standards actually led to Beija being classified by the U.S. government as a "Virgin Cane Rum." This is the first product that has ever received this official designation. The name of their Cachaça and the design of its bottle certainly are evocative of something sensual, which is probably fitting considering it is a Brazilian spirit. The name "Beija" is a Portugese word and roughly translates in English as "to touch with the lips as a sign of love." The Beija logo is a combination of an alluring female figure in profile and the letter "B" for Beija. Beija has just been released in the Boston market this month. Rather than try to cover the entire country, Kevin and Steve are first concentrating on the northeast, especially the Boston area. Beija is currently available in some of Boston's lounges and bars including Eastern Standard, Vintage Lounge, OM, Vox and the Foundation Lounge. It will soon be available in some select liquor stores in Boston in 750 ml bottles and will cost around $30. That is certainly an average price for a high-end spirit. This is the official tasting profile of Bejia: "At room temperature, a distinct rock-candy aroma is complemented by a mineral note reminiscent of fresh-cut slate. When chilled, a tropical, herbal aroma emerges, producing a pure, fresh scent; a result of the single distillation. Smooth on the palate, the taste is clean and echoes the aromas with the herbal note leading the way; a squeeze of lime brings out more rock candy. The finish offers a minty, clean aftertaste." I was very intrigued by the story of Beija. It sounded like it had potential, that it was an artisan spirit where its quality was a primary concern. And I was impressed by the passion of Kevin and Steve. They seemed to truly believe in their product. They did not make any type of hard sell. They seemed confident that their product could speak on its own. As I have often said, it is such passion that often can lead to a high quality product. It is such passion that I seek in others. But, though that passion was evident, how was the Beija? I began my tasting with a glass of Beija on the rocks. This is my preferred method of drinking high-end spirits. I like to savor the pure flavors of the spirit. I first smelled the Beija and noted some intriguing and pleasing herbal aromas. When I initially sipped it, I immediately thought of high-end tequilas. It did not taste like a tequila, but the way the flavors of the Beija struck me reminded me of how the flavors of a tequila strike my palate. The Beija was very smooth and had no bite at all. There was no unpleasant aftertaste. That is exactly how high-end tequilas taste to me. The flavors of the Cachaça also formed a distinctive undercurrent. You would not confuse these flavors with any other type of spirit. To me, tequila has a similar flavor undercurrent in which you definitely know you are drinking tequila. Even if blindfolded, you would not have any trouble knowing you are tasting a high-end tequila because of that undercurrent. In the same way, if blindfolded, you would still know you were drinking Beija. What struck me as the most prominent flavors of the Beija were exotic herbal notes. I could not specifically identify any particular herb. But the herbal flavors meshed well together to create an intriguing melange. A tantalizing mix where the blended herbs could not be separated into their individual components. Yet the whole of the mix was very pleasing. I very much enjoyed the flavor and smoothness of the Beija and felt that I could easily sit and drink this on the rocks. I then moved onto some Beija and soda water. I generally dislike spirits and soda water as I do not care for the carbonation. But, this would certainly please someone who does not like drinking spirits straight. The flavors of the Beija were not covered up by the soda water so you would still be able to savor its unique taste. If I di drink a mixed drink, that is what I like, that the flavor of the spirit is still noticeable above the other ingredients. Next, we tried a Caipirinha, Brazil's most popular cocktail. This cocktail contains muddled limes, sugar, ice, and Cachaça. I enjoy this cocktail, as long as they do not make it too sweet. I don't mind a sweet flavor, as that is part of this cocktail, but I also want to be able to taste the Cachaça. The lime also pairs well with the herbal notes of the Cachaça. Caipirinha is starting to become a more popular drink in the U.S. so you may see them offered on many drink menus. We had a couple other cocktails with various fruit juices, fruits (such as raspberries) and Chambord liquer. The Cachaça paired well with the different fruit flavors presenting an intriguing combination of fruits and herbs. Like any such drinks, these can sometimes be too sweet which masks the flavor of the Cachaça. I would suggest that when ordering such drinks, you ask them to be light on the syrup and sweeteners. You want to be able to enjoy the flavor of the Cachaça. One of the best cocktails I tried with the Beija had some basil in it. The basil just seemed such a natural combination for the herbal flavors of the Beija. I don't recall any other drink that I have had with basil that seemed to mesh so well. I could picture sipping this cocktail with some Italian food, a nice chicken parmigiana. This cocktail definitely impressed me. You can find additional cocktail recipes on the Beija website. Overall, I was very impressed with the Bejia. It was certainly excellent straight and it was a very good ingredient in numerous cocktails. The herbal flavors made for an interesting pairing with the other ingredients. Though I enjoyed the Bejia, how would others rate it? A couple days later, I took a bottle of Beija with me to my regular poker game. Nine of my friends tried the Beija, either straight up or with a little bit of lime juice. By the end of the night, the bottle was nearly empty. It was a big hit and everyone very much liked it. They commented on its smoothness and unique flavor. Though none of them had ever tried Cachaça before, they all enjoy high-end spirits, including rum. They would definitely drink Beija again. And I enjoyed the Bejia that night as much as I had previously. So the passion of Kevin and Steve has led to an excellent product. I heartily recommend the Beija and it will certainly be a staple in my house. If you have never had Cachaça before, then give the Bejia a try. If you have had Cachaça before but did not like it because it was too harsh, give the Bejia a try. If you have had Cachaça before and enjoyed it, then the Bejia will truly please you. If you try Beija, please tell me about your own experiences. If you could not book a reservation at a hot Boston restaurant, would you be willing to pay a fee to obtain that reservation? If so, then a new service coming to Boston may answer your prayers. Today's Boston Herald as an article, "Company Has Reservations," about TableXchange, a new online service that will provide a way to purchase other people's reservations. TableXchange began last year and currently covers New York City, the Hamptons and San Francisco. It is now headed to Boston. People who have a reservation for a popular restaurant, but who cannot make that reservation, can offer that reservation for sale on TableXchange. This would be like the Ebay or Craig's List for restaurant reservations. Sellers must charge a fee that is a multiple of $5 but the fee cannot be more than $40. It is free to post but TableXchange takes a 12% fee from all reservations that are sold. TableXchange only permits certain restaurants to be on their list, generally just the ones where reservations can be difficult to obtain. Is there a real need for this service in Boston? How many restauarants is it that difficult to get reservations? In my experience, if you make reservations far enough in advance, it is rarely a problem gaining entrance to any Boston restaurants except for the most brand new places. It is when you try to make reservations a week or less ahead of time when you will have the most difficulty. Boston lacks restaurants like Per Se and Masa in New York City which are extremely difficult to obtain no matter how far ahead you try to book. For last minute booking in Boston, the TableXchange service might be useful. Some people would not have trouble paying an extra $20 to get a last minute reservation at a restaurant they truly want to visit. But, there is a potential downside where people could start making reservations at the top restaurants only so they can later sell them on TableXchange. TableXchange does put some protections in place against that, limiting the number of reservations a seller can sell during a given time period. I am not sure I would ever have use for this in Boston, though I might when visiting New York City. I would pay a bit extra to be able to get a reservation at Per Se. Just a final reminder that I am holding a Sake Review contest this month. You can win two books on Sake and all you have to do to enter the contest is drink and review a bottle of Sake. Check out my prior post for all the details. There are only a couple days remaining in the contest. And I have not yet received any entries. This is your chance to try a chilled Sake, to taste what is like. Why not take that chance? You might find find a new drink that you enjoy. And you could win two books as well. Is Saké Dying in Japan? The Saké market in the U.S., as well as other foreign markets, continues to increase. During the late 1990s, the export volume of Saké quadrupled and the U.S. and Taiwan were the two major markets. It is also said that The U.S. market for Saké has nearly doubled in volume and quadrupled in value. According to the Japanese Ministry of Finance, the value of exported Saké to the U.S. exceeded about $23 million, up 10% from 2005. Though Saké exports are continually increasing, Saké production and consumption in Japan has actually been declining. The 1960s were the most years for Saké and there had been approximately 4000 Saké breweries in existence during that period. Nowadays though, the number of Saké breweries is less than 1500. And Saké breweries continue to close every year. A few years ago, the Saké industry was even officially recognized as fukyo gyoshu ("a depressed industry"). Saké sales almost halved between 1996 and 2004. Its share of Japan's alcohol market is decreasing by almost 10% each year. Certainly a dire situation for this traditional product. The younger generation are the ones moving away from Saké. Saké is seen more of as a drink for old people. Beer is the drink of choice for the young, while other spirits and wine are also increasing. The Saké industry has begun to strike back, trying to market Saké as hip and modern, rather than just a stuffy old alcohol. Will this work? Only time will tell but it seems that even if Saké can make a resurgence, it is unlikely to ever reach its prior heights. At least Japanese Saké brewers do have a growing export market for their product. My next column of "A Passionate Foodie" can be found in the January 30 issue of the Stoneham Sun newspaper. This is my weekly column that concentrates on reviews of local restaurants as well as other interesting food and wine topics. The new column will be published tommorrow and is currently available online. The new column is a bit of a change. Instead on concentrating on dining out, I have decided to address dining in. So, I have offered several of my favorite recipes so that you can dine at home. The recipes include Garlic Teriyaki Sauce, Orange Goat Casserole, Swedish Apple Pie and Cinnamon Rolls. If you have any questions or comments about my column, feel free to add them here. Next week, I will present some Valentine's Day wine recommendations. Seeking a Valentine's Day dinner choice? What about some Spanish tapas? Tapeo Restaurant and Tapas Bar is having a special Five Course Tasting Menu for Valentine's Day. The dinner cost $40 per person and includes your choice of one cold tapa, two hot tapas, a tapa size portion of Paella, and your choice of a dessert. You can also order off the regular menu. One of their newest tapas is the Albóndigas Cythereanas (Aphrodisiac Lamb Balls) which are an alluring combination of lamb, Serrano ham, exotic spices, shallots and sherry. They are served in a seductive broth with onions, garlic, red peppers, tomato, sherry and red wine. This dish is sure to set the mood this holiday. Tapeo is the sister restaurant to Dali in Cambridge. Dali is my one of my favorite restaurants and unfortunately they will not have this Valentine Tasting Menu, though they will have the Albóndigas Cythereanas. I prefer the romantic ambience of Dali but Tapeo serves basically the same menu and the food is superb. Though I prefer Saké on its own, it is also a versatile drink that can be used in many different cocktails. As Martinis are currently very fashionable, you are starting to see Saké used in a number of different Martinis. At its easiest, Saké can be used as an interesting substitute in almost any cocktail that calls for vodka and gin. For example, you could make a simple Saké Martini, substituting Saké for your vodka or gin. Or try a Saké Margarita, Saké Screwdriver, Saké Sunrise, Saké Sour or a Saké Bloody Mary. Such cocktails do not require any other changes except substituting Saké for either main liquor. In general, if making such a cocktail with Saké, I would recommend that you use Junmai or Honjozo Saké. I would not recommend using a Ginjo or Daiginjo Saké as they are generally more subtle and in a cocktail you would lose many of those flavors. A Junmai or Honjozo are more likely to stand up to the other ingredients in a cocktail. Nigori Saké is a special case as it tends to have a milky color and be sweeter. It would not be a good substitute for basic cocktails as mentioned above. But, a Nigori would go well in a cocktail that is intended to be sweeter and in which the milky color does not detract. A Nigori Pina Colada might work well or maybe mixing it with some Bailey's to make more of a dessert Martini. Beside the basic cocktails, restaurants and bars are getting creative with Saké, concocting their own special creations. For example, Haru in Boston has their own version of the Saketini, which contains vodka, Saké, and plum wine. It also has a few thin strips of cucumber in it. This is quite delicious and was not overly sweet. You can find plenty of other Saké cocktail recipes online. Just do a Google search for "Saké cocktail recipes." But I do want to mention two other intriguing Saké concoctions. What appears to be an American creation is the infamous Saké bomb. This is not really a cocktail as such, but more just a specific way to drink Saké and beer. You start by filling a beer glass halfway with a Japanese beer like Kirin, Sapporo or Asahi. You could use other beers as well but it is more thematic to use a Japanese beer. Then fill a small Saké cup with warm Saké. Place two chopsticks in a "V" shape atop the beer glass. Carefully balance the Saké cup atop the chopsticks. You then slam your hand down on bar so that the Saké cup falls into beer and you immediately chug the beer and Saké mix. Just be careful not to get hit in the face by the Saké cup in your beer glass. To me, it is a waste of good Saké but it is popular with some. Another interesting recipe is Saké Sangria. This makes more of a white Sangria. You mix 1 1/2 cup Saké, 1/2 cup orange juice, 1/4 cup brandy and 4 teaspoons of sugar. Mix thoroughly until the sugar is dissolved. Then add some mixed fruit and top it off with a little soda water. Place it in the refrigerator and let it sit for 4-6 hours. It is then ready to drink. I have not tried this yet but it sounds interesting and I will probably try it soon. If you enjoy Saké, then be adventurous and try creating your own cocktails with it. If you create something really good, feel free to post it here in the comments. Lenndevours, the founder of the popular Wine Blogging Wednesday, has decided to select a new logo for this event. To choose a new logo, he is holding a special contest, seeking suggestions from anyone interested. You can submit entries at any time by emailing them to Lenndevours at winebloggingwednesday@gmail.com. The deadline for entries is March 31, 2008. Once all of the entries have been received, they will be posted to Flickr and everyone can vote for their favorite. Though no prizes have been decided for the contest, it is very likely that people will donate prizes. Check out Lenndevours for more info on this contest and getting thinking about a new logo. This past Thursday, I went to the Lower Falls Wine Co. to attend another of their special tastings. This time, they had a couple special guests, Lorenzo Corino and his son Guido, there to showcase some of their Case Corini wines, all-organic Italian Barbera wines. These wines are imported by Adonna Imports. I attended a previous wine tasting at Lower Falls for these Case Corini wines but Lorenzo had not been there. You can check out my prior review. I very much enjoyed their Barberas and wanted to taste some of their other wines. Eileen Wright, of Il Capriccio and Adonna Imports, accompanied Lorenzo and Guido. Lorenzo Corino makes organic Barbera d'Asti in the town of Costigliole in Italy's Piedmont region. He is the fifth generation that has lived amongst the vineyards. Lorenzo is a soil scientist and is concerned about the health of the ecosystem in his vineyards. He believes that much of the wine is made in the vineyard so he does not subject his wines to lots of technical manipulation. 2001 Barbera d'Asti "Bricco" ($55): This is 75% Barbera, with a few other rare, indigenous Italian grapes. This had a fragrant nose and lots of fruit on the palate as well as a bit of a tannic structure. It was an easy-drinking wine, lacking some complexity. 2003 Barbera d'Asti "Bricco" ($55): This vintage was a mild but hot summer. This wine was fruitier and less tannic than the 2001 vintage. It certainly would be very approachable now and would not need any cellaring. 2003 Barbera d'Asti "La Barla" ($85): This was my favorite wine of the previous tasting. It is 100% Barbera from old vines. This time, the wine pleased me as it did before. It had great structure, lots of complexity and was a silky pleasure. Nice concentration and a very lengthy finish. 1999 Barbera d'Asti "La Barla" ($85): I found this vintage to be even smoother and silkier than the 2003. The tannins were very mild and the fruit flavors were subtle and complex. There was a taste of cherries, strawberries and a bit of raspberry. There were hints of spice and a lingering finish that tantalized my senses. An exceptional wine that thoroughly impressed me. And I did have to buy a bottle, despite its price. 1996 Barbera d'Asti "La Barla" ($85): I heard several people at the tasting state that this was their favorite wine of the tasting. Yet it turned me off. It had a very funky nose, a barnyard smell that put me off. The taste contained elements of that funk as well as stewed tomatoes. I just did not like this wine though it certainly was popular with others. Overall, these were excellent wines. They were Old World style, well balanced and had lengthy finishes. They would be fine on their own, or paired with food. They probably could be paired with many different foods as well, from Italian food to game like duck or even venison. Though I could also just sit and drink these wines on their own, savoring their flavors. Another great tasting at Lower Falls and another worthy selection from Adonna Imports. I was fortunate enough to get to try a new grape today, the Saperavi, which I had not even heard of before. But then today was probably only the second time that I have ever had a wine from Georgia. Not the state, but Georgia the country. Georgia is located on the west coast of the Black Sea, south of Russia and north of Turkey, Armenia, and Azerbaijan. It may be the oldest wine producing region in the world, having culitivated grapevines as long as 7000 years ago. Some even believe that the word "wine" is derived from the Georgian word "gvino" which means "wine." It was traditional for Georgians to ferment their wines in clay vessels, called "kvevri," and bury them underground. They would also store fermented wines underground in these vessels as well. The 2004 Kakheti Cellars Pirosmani Kakkuri is a semi-sweet red wine made from the Saperavi grape. The grape is grown in the Akhobi vineyards of the Alazani valley in Georgia. In a nod to the ancient traditions, this wine was fermented in clay jars buried in the ground. It has a listed alcohol content of 10-12.5%, which is a bit curious that they do not get more specific than that. It also has a listed sugar content of 15-25 gr/dm3. Saperavi is a Georgian word which means literally "paint" or "dye," due to its intense dark-red color. It can produce red wines suitable for extended aging and is the most important varietal in Georgia. The grape is used to produce both sweet and dry red wines. This was a very dark red wine in color with a nose of dark berries, maybe some blueberry. As this was a semi-sweet wine, I expected some prominent sweetness on the palate. But, I was pleasantly surprised to find only the barest hints of sweetness. If I had tasted this blind, I would not have called it semi-sweet. It was a very smooth wine, with rich fruit flavors and a rather long finish. It was not very complex but was a pleasant drink. It is a wine that would please many, including those who do not care for dry wines. Custom-dipped chocolate beignets! Does it get any more decadent? I can just envision the hot, fried beignet (reminding me of New Orleans) slathered with a dark, creamy chocolate. When I was in New Orleans, I had to have one of their delicious beignets every day. So, when I heard that a new local store would be selling chocolate covered beignets, I almost started salivating. Chocolee Chocolates is a new chocolate store opening on February 8 in Boston's South End. And during Valentine's Day week, the custom-dipped chocolate beignets will be available on a limited basis. The Proprietress of this new store is Lee Napoli who has worked at or consulted for many local restaurants over the past 10 years including Icarus, Maison Robert, Grill 23, Anago, Metro, Bricco, The Buttery and Sandrine’s Bistro. She also established the region’s first and only association for pastry professionals in the 1990s, the Professional Pastry Guild of New England, and still acts as its head. While winning cake awards, constructing gingerbread houses, and turning out thousands of perfect cookies, tarts, pies and pastries, Lee’s secretly been making truffles in her downtime – sold without fanfare at a select few hidden venues. She has now chosen to take the plunge into fulltime chocolate-making, and open Chocoleee, her jewel box of a truffle emporium. Chocolee Chocolates specializes in handmade truffles, available by the piece ($2.25) or by the pound ($40). The chocolate truffles come in five signature flavors (espresso, hazelnut, chocolate mint, Grand Marnier and poblano chile). Lee will add more products depending upon demand. 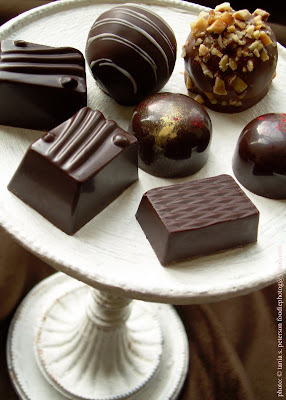 Currently, besides the truflles, she is filling chocolate candies with a honey-bourbon-cherry cream, enrobing salted caramel with dark chocolate and experimenting with exotic flavors for next season. If you cannot make it to Chocolee, you can also find the truffles at some Whole Foods Markets in the Boston area. And remember that those chocolate covered beignets are only available for a limited time! Just a reminder that I am holding a Sake Review contest this month. You can win two books on Sake and all you have to do to enter the contest is drink and review a bottle of Sake. Check out my prior post for all the details. There is less than a week remaining in the contest. This is your chance to try a chilled Sake, to taste what is like. Why not take that chance? You might find find a new drink that you enjoy. Where can you buy Saké? Where can you find more information about Saké, including Saké reviews? What Saké books should you buy? Let me provide you with some additional Saké resources, some places, sites and books that I recommend. Sadly, many wine stores carry few, if any, brands of Saké. But this is changing and more and more places are starting to carry Saké. I have three particular recommendations for stores that carry an extensive collection of Saké, places where you can find many different varieties of Saké. True Sake: This was the first all Saké store in the U.S. country. Located in San Francisco, this is an excellent store with over 150 different types of Saké, all imported from Japan. I have been there and would highly recommend it. They have free tastings and host other events as well. They have a good website and they do ship as well. Sakaya: This is a new all Sake store that opened last December in New York City. I recently visited this store and you can check out my review. I thought it was an excellent store with a diverse selection of Saké. If you are in New York City, you must stop here and check it out. Sake Nomi: This is a new all-Sake store located in Seattle, Washington. I have not yet been there but their website is enticing. If anyone goes there, please tell me what you thought. The Sake Shop: Located in Honolulu, Hawaii, this shop opened in January 2010, and I have not been here either, though it too sounds great, with a nice selection of Sake and regular tasting events. Astor Wines & Spirits: This is one of my favorite wine stores in New York City and they have a large and diverse selection of Saké. They have a cooler area where they store many different types of Saké including some excellent Namazake. Here are three websites that provide much information concerning all aspects of Saké. Sake World: This site is run by John Gauntner, a leading non-Japanese authority on Saké. It is a very extensive site and you can also sign up for his Saké newsletter. ESake: This is another large reference site for Saké, and John Gauntner contributes there as well. Japan Sake Brewer's Association: This site has some basic information about Saké, its brewing process and breweries in Japan. Sake Social: This site has a blog filled with plenty of educational info about Sake and it is also a source for purchasing Sake. Though there are hundreds of wine blogs out there, the number of blogs dedicated to Saké is very small. Here are the best Saké blogs of that small group. Check them out for Saké reviews, articles, commentary and more. There is only a small number of Sake books available, with some of them out of print. Here is a list of about 20 such books, most which I own. It is a chilly day, the perfect time for some comfort food, such as a nice chowder. And now I have a new chowder to try and share with you. I previously posted about how Chef Paul O'Connell of Chez Henri in Cambridge will be attending the Taste of the NFL, an annual event where a chef is invited to represent each NFL team. The event is held on the eve before the Superbowl. Each chef cooks up a special dish and the public is invited to taste all of these culinary delights. All of the ticket proceeds go to charity, to America’s Second Harvest, a national anti-hunger clearinghouse that funnels money to organizations across the country who feed the needy. Chef O'Connell will be making Smoked Cod & Lobster Chowder with Chile-Lime Butter. Now that certainly sounds very delicious to me. I love chowder, especially seafood chowders, and it is great winter dish. To my good fortune, Chef O'Connell has generously provided me with a copy of his recipe to share with my readers. Enjoy! 1. Rinse the smoked cod in cold water for one hour. Pick through the lobster meat and cut into 1/2-inch pieces. 2. Place the butter in a large casserole over medium heat. Add the onions, leeks, herbs and potatoes and cook until the onions are soft and sweet stirring occasionally so as to not let anything brown. 3. Add the white wine and heavy cream and bring to a boil for 2-3 minutes. 4. Add the fish fume and the smoked cod and simmer until the cod is tender. 5. Add the lobster and season with salt and pepper. While walking around Boston this past Wednesday, I passed by Federal Wine & Spirits. Luckily, they were having a wine tasting so I stopped to check it out. Though I have been to this store several times before, I had never been around for their tastings before. And the theme of this tasting intrigued me. Federal Wine & Spirits is a cramped little store with a small room on the ground floor and a larger area in the basement level. Yet they have an interesting selection of wines, including some rarities. They hold free wine tastings every Wednesday night from 5-7pm. The staff is very helpful and they have some knowledgeable staff. The theme for the tasting was Montepulciano vs. Montepulciano: The Grape Vs. the Town. Interestingly, the Italian grape Montepulciano is not grown in the city of Montepulciano. Instead, the town of Montepulciano grows Pugnolo Gentile, a clone of Sangiovese. So, the tasting compared three wines from the town of Montepulciano (Sangiovese based wines) to three wines from Abruzzo made from the Montepulciano grape. An intriguing idea and the type of tasting that I really enjoy. It is educational to make such comparisons as you truly gain an understanding of the differences between such wines. Such a tasting theme is far better than tasting just a random collection of wines. We began the tasting with the 2006 Memo Montepulciano d'Abruzzo ($9.95). This was a light colored wine with lots of fruit flavors and a little spice. An easy drinking wine that would go well with pizza or pasta. A good value for the price. Next, we tried the 2004 Avignonesi Rosso di Montepulciano ($15.95). This is one of the oldest wineries in Montepulciano, the estate dating back to the fourteenth century. The fruit flavors in this wine were less upfront, more subtle. They blended well with a bit of spice and herbal notes. A more complex wine that also had a nice, long finish. For the third wine, we tasted a 2004 Valle Reale Montepulciano d'Abruzzo ($19.95). The nose was intriguing with dark fruit and dark spice aromas. This wine was richer than the previous two, with more noticeable tannins and a fuller flavor of dark berries. It had a lingering finish and was a very pleasing wine. An excellent buy for under $20. The wines only got better. Next was the 2004 Polizziano Vino Nobile di Montepulciano ($32). This full bodied wine was rich with complex flavors of layered fruit and spice. There were some strong tannins yet they did not overpower. This is a definite food wine, yet one to linger over as well. It has a very long finish that is so satisfying that you don't want to end. An excellent wine. My favorite wine of the tasting was next, the 2003 Cataldi Madonna Montepulciano d'Abruzzo Malandrino ($45.95). A very dark red wine with a vibrant nose of lush blackberry and spice. A full bodied and rich wine with lush dark berry flavors. A complex wine where every taste seems to bring different flavors. The lingering finish is seductive and silky. A hedonistic effort sure to please. I highly recommend this incredible wine. The final wine was the 2001 Valdipiatta Vino Nobile di Montepulciano Vigna d'Alfieri ($54.95). This wine is made in a strictly traditional, organic style. This was a medium red color that seemed more tannic than the Malandrino. Its fruit flavors, cherry and raspberry, intermingled with herbal notes. It had a very long finish as well. Though this was a good wine, it was not quite my style of wine. Overall, this was an excellent tasting. I generally preferred the wines from the Montepulciano grape though I very much enjoyed the others as well, except for the Valdipiatta which was just not my style. Kudos to Federal Wines for hosting this wine tasting. If you are in Boston, check out this store, especially on Wednesday evenings for their weekly tastings. Sign up for their newsletter too. Valentine's Day approaches rather quickly so now is the time to make your dinner reservations if you hope to get a table, especially at certain prime hours. So today I offer a selection of some options you might want to consider. "Perfect Pairs” on Monday, February 11th at 6:30 PM – a casual wine tasting with romantic food matches on small plates for $25 p.p. Service as usual on February 14 with special Valentine’s Day dessert creations by pastry chef Claire Garland. --Grilled Rib Eye with blue cheese baked potato, crisp shallots and truffle butter. Four course prix fixe menu @ $80 p.p. My regular readers will know that I am a big fan of L'Andana restaurant. If you don't know, check out my last post on L'Andana. If you have not eaten there yet, you definitely should go. It is one of the best new restaurants. I have some good news to announce concerning L'Andana. On January 28, they will open their doors to serve lunch, Monday through Friday, from 11:30am-2:30pm. They did not have a menu available yet but mentioned that the menu will include items such as salads, pasta dishes and sandwiches. I am looking forward to their lunch and will likely try it out next week. In addition, L'Andana will soon start serving Sunday brunch. Brunch will start on February 10, from 11:30am-4pm. Can't wait to try out lunch and brunch! It was once thought that we could only taste four flavors: sweet, sour, bitter and salty. Umami is a fifth flavor and the term translates roughly as "delicious" or "yummy." It is now considered a legitimate flavor with a scientific basis. It appears that glutamic acid is the key component in food rich in umami such as parmesan cheese, ripe tomatoes, soy sauce and scallops. Saké can also possess umami in varying degrees. What are the appropriate foods to pair with Saké? The Japanese have an apt saying, Nihonshu wa ryori wo erabanai. This basically translates as "Sake does not get into fights with food." This is an indication that they feel Saké pairs well with many different foods, and generally won't overpower anything. With all the different types of Saké, there really is Saké that is appropriate for nearly any type of food. There are some standard foods that are considered most appropriate for Saké and they are collectively referred to as "sakana." This usually includes slices if raw fish, grilled meats, vegetables (often pickled), edamame and tofu. Almost all Saké really goes well with seafood. Here are a few general guidelines for Saké and food pairings. Junmai Saké are sometimes considered to be the “red wines” of Saké and thus can pair with stronger foods, including beef, fried foods and rich sauces. Ginjo and Daiginjo Saké are lighter, more subtle, and thus need to be paired with milder foods. Nigori Saké and aged Saké pair well with desserts. As Saké acidity varies, you should pair higher acidic Saké with oilier foods. Lower acidic Saké pairs better with rich or salty foods. What foods shouldn't you eat with Saké? The primary guideline is that you should not drink Saké with rice dishes, including nigiri sushi and maki rolls. Since Saké is also made of rice, it is thought that pairing rice with rice does not work well. I don't usually follow this guideline though, often drinking Saké at Japanese restaurants with my sushi. I have not really found it to be a problem. But some will look askance at the practice. Like any wine, Saké can be used in cooking. In most recipes that call for the addition of wine, you could probably substitute Saké instead. There are many benefits to cooking with Saké. It is said that cooking with Saké adds flavor, helps other ingredients absorb other flavors, reduces the strength of some strong odors, reduces the impact of salt and can help tenderize meat. I have two favorite receipes involving Saké. First, there is my Garlic Teriyaki recipe. You can make this ahead of time and store it in your refrigerator for when you need it. It is very versatile and can be used on fish, poultry, meat and more. Second, there is the Saké Miso Glaze. This too is a versatile glaze, though it is more commonly used for fish. Combine the miso, mirin, Saké, ginger, oil and sugar in a large bowl and stir until the mixture is smooth and well mixed. Coat your fish, poultry or meat with the mixture. Cover the coated item with Saran wrap and marinate overnight in your refrigerator. The next day, saute or broil your Miso glazed fish, poultry or meat. The theme for Wine Blogging Wednesday #42 has now been announced. Spittoon is hosting this month and has chosen an intriguing theme. You must review an Italian wine, of any time but hopefully something new and unique, but use only Seven Words. Additional rules: "The finished tasting note must make sense, be grammatically correct(ish), punctuation will help of course. The wine name, type, producer, vintage do not have to be included in the 7. But a reference to aroma, flavour, length, food matching etc. should be considered. Inventiveness is the key." You just post your review on Wednesday, February 13 and email him with a link to your review. If you don't have a blog, email her your tasting notes and she will be happy to publish them on her site and include it in the Round-Up. This will certainly be a challenging theme but one I look forward to participating in. Won't you try it as well? My next column of "A Passionate Foodie" can be found in the January 23 issue of the Stoneham Sun newspaper. This is my weekly column that concentrates on reviews of local restaurants as well as other interesting food and wine topics. The new column was published today and is currently available online. The new column is a restaurant review of Summer Winter, a new restaurant in Burlington. This new place is a collaboration between Chefs Mark Gaier and Clark Frasier, the chefs/owners of the renowned, high-end Arrows Restaurant in Ogunquit, Maine. Summer Winter though is a more casual restaurant. If you have any questions or comments about my column, feel free to add them here. Next week, I will present another restaurant review. Saké-Nog: Cure for a Cold? Seems like so many people I talk to right now have a cold or the flu. Winter time, and time for various illnesses. I have been lucky so far, having avoided being sick. I certainly hope that I can avoid being sick all winter. If I did catch a cold, there are lots of medications I could take to try to stave off the worst part of it. Or I could try some more natural solutions. What do you use to stave off your colds? And have you ever considered Saké as a cold remedy? In Japan, tamagozake is a traditional home remedy for the cold. Tamagozake, which translates as "egg Saké," is a drink made from Saké, sugar and raw eggs. Outside of Japan, this may also be called Saké-Nog because of its resemblance to egg nog. Tamagozake is given to both adults and children. There are a number of different recipes to make tamagozake though they generally share the basics. Traditionally, tamagozake should also be eaten using chopsticks. It is supposed to be eaten when you first feel a cold coming on. Are you willing to give it a try? Here are a couple recipes for tamagozake. Mix the egg and sugar in a small bowl. Heat the Saké in a microwave until warm. Then add the warm Saké to the egg/sugar mixture and mix well. Makes one serving. In a saucepan, heat the Saké and let it cook for a bit to evaporate the alcohol. Remove from heat and let cool for a few minutes to let it cool. Add beaten egg to Saké little by little, stirring constantly. Then add the sugar and place back on a very low heat, stirring constantly until thick and creamy. Makes one serving. In a small saucepan, heat the Saké over medium until hot but not boiling. In a small bowl, mix a beaten egg and honey until completely combined. Add the Saké to the egg/honey mixture and mix well. Makes one serving. With Valentine's Day approaching, it is the time to start thinking about what sensuous drinks might go well with you and your Valentine. Here is one interesting option, the Love Potion # Pho. Pho Republique, a French-Vietnamese restaurant in the South End, has created this intriguing cocktail. This cocktail ($10) will be available at the restaurant from February 1 – 29. Or, you can make it at home as they have generously provided the recipe. Love Potion # Pho is made with 1 3/4 oz Stolichnaya Peachik (peach vodka), a dash of passion fruit syrup, and 3 oz of lemon/lime juice. Shake over ice and then pour into a martini glass. Rim the glass with grenadine dipped sugar and top with Sorelle Bronca Prosecco. I always note that Pho Republique turns 10 this year! It is time once again to vote in the 2008 Reader's Choice Awards. This will be an insert in many of the local papers, including our own Stoneham Sun. There are over 70 categories in which you can vote. You don't have to vote in each category. You only have to vote for at least 10 categories. You can only vote once and the deadline is February 13. What is important to me are the numerous restaurant and liquor store categories. Last year, some of the results surprised me and I did previously discuss my thoughts. What most surprised me were some of the omissions as well as a few of the places received that Best votes. I hope that my local readers vote and support local places. The ballot only allows you to vote for a single choice in each category, which may be part of the reason for why some places were omitted. It might have been better if you could have voted for a few choices in each category. Please Vote and help your local favorites. Are you looking for some Saké recommendations? If so, here are the links to all of the Saké I have reviewed so far on my blog. If I had to recommend a single Saké, especially for someone who has never really drank any Saké, then I would have to choose the Hakushika Junmai Ginjo. First, it is relatively inexpensive at $8-9 for a 300ml bottle. Second, it seems available in many different places so should be easy to find. Third, it has a nice clean taste which should not offend anyone. It certainly is so drastically different from a pungent hot Saké. The Hakuskika will give you a good example of the potential of Saké. Reminder: I also want to bring to your attention again that I am holding a Sake Review contest this month. You can win two books on Sake and all you have to do to enter the contest is drink and review a bottle of Sake. The deadline is January 31. Check out my prior post for all the details. Though I have yet to drop by The Beehive, I have been hearing lots of good stuff about it. It certainly seems one of the hottest new spots in Boston. I recently received some information about a couple of upcoming events at The Beehive and wanted to alert you to them. They certainly sound interesting and worth checking out. The Beehive is an underground Bohemian bistro located below the Boston Center for the Art’s Cyclorama in the South End. They serve the eclectic fare of Chef Rebecca Newell: rustic comfort foods infused with American, European, Mediterranean, and Middle Eastern influences. They serve dinner as well as weekend brunch. This will be held on Fat Tuesday, February 5th, from 8:00 PM – 12:00 AM, and they have endeavored to make this event as authentic as possible. There will be the "groovin’ gumbo" sounds of the Nat Simpkins/Henri Smith Band. Henri Smith moved to the Boston area shortly after being displaced by Hurricane Katrina. A portion of proceeds from the evening’s event will go to the Tipitina's Foundation, a New Orleans based charity that provides support for displaced musicians to keep the Big Easy Swingin’. There will be a Cajun inspired Ala Carte menu featuring items such as Oysters Rockefeller, Shrimp Etouffee Vol-Au-Vent, and Jambalaya. You can finish your meal with the Beehive’s Epiphany King Cake, including your very own miniature baby decoration attached. The bar will be serving special drinks including Beehive Hurricane’s, Spicy Oyster Shooters with vodka and Tabasco, and the Sazerac Cocktail made with Sazerac rye, Kübler Absinthe and Peychaud bitters. Kübler Superieure is a well-known brand of absinthe, distilled in the Val-de-Travers region of Switzerland, also known as the birthplace of absinthe. Attendees will be lavished with plenty of beads necklaces, masks, and the traditional Mardi Gras doubloons coins for throwing. There is no cover charge for this event. Their regular menu will be served in addition to all special items. Throughout the evening our luscious band of lovers will be distributing numbers and collecting anonymous Valentine’s to and from all of the prospective paramours and mysterious vamps in attendance! How it works: Love seekers will receive numbers upon entry allowing attendees to send anonymous messages to those they like, love, or lust! As the game unfolds, identities will be revealed, and matches will be made; building up to the glorious crescendo at midnight when the King and Queen of the First Annual Love Ball will be crowned! The Love Ball Unlimited Orchestra will play on as that Mac Daddy of Soul, Ron Murphy presents the “between the sheets” music of the original love king himself, Barry White. You can also the “Fondue for Two” menu consisting of three courses of cheese fondue with fresh fruit and brioche, a special beef bourgogne fondue, and Chocolate Fondue made with 100% Belgian Callebaut Chocolates served with Oreo’s, graham cracker, almond biscotti miniature marshmallows and fresh strawberries. The Beehive’s Love Potions will put the spring back in your Aphro-dees-i-ack! These concoctions include several oyster laden "lovely's" and a very special tonic we call “Behind the Green Door” The Ingredients are secret, but we are legally obliged to inform you that they do include: Mumm Napa, Absinthe and fresh strawberries. One of the keys to an excellent restaurant, a restaurant that rises above the rest is consistency. Consistency means that each and every visit is as good as the last. The quality does not diminish or vary over time. It is a restaurant where your expectations are met on every visit. Such consistency is a sure sign of excellence, that the entire restaurant works with synergy, that each individual component does its function and that all of those individual parts work well together. Rendezvous in Central Square, Cambridge, is a restaurant of consistency, a place that continues to provide excellent food and service on each and every visit. I have been there numerous times and have reviewed Rendezvous a few times. My most recent visit has greatly pleased me again. I began with the Ceviche of Scallop and Shrimp ($12), a new dish on their menu. Usually, I see ceviche served in a cocktail glass or similar glass, but this was just served on a flat plate. The presentation was nice though with the combination of seafood, chile oil, and fruits. The seafood tasted very good, with a spiciness that tingled my tongue. The little slices of what seemed like blood orange were sweet and delicious. Next, I had the Boston lettuce salad with apples, cheddar cheese, spiced pecans and a cider vinaigrette ($10). This was quite a large salad with a big hunk of lettuce and plenty of the other ingredients. A great mix of flavors and for the price this is an excellent value. As an entree, I just had another appetizer, the Potato gnocchi with braised oxtail, chantenay carrots and horseradish ($13). Their pasta dishes are usually very good and this was no different. Pillowy gnocchi with tender oxtail pieces in an interesting gravy. As an appetizer, this is still a decent-sized dish. My her entree, my wife had the Gascon style duck 3 ways, which included grilled breast, confit leg and garlic sausage ($26). A large plate of so much tender and flavorful duck. The sausage was quite big and an interesting sweet taste to it. The breast and confit were meaty, with some crispy skin, and just melted in my mouth. It came atop a bunch of root veggies. This was an exceptional dish and I would strongly recommend it. Rendezvous has an interesting wine list, usually including some very different wines. Their prices are generally reasonable and there are plenty of choices under $35. I wanted a lighter wine for the evening, maybe a Pinot Noir. But I was intrigued by the 2005 Ascheri "do ut des" Verduno Pelaverga, which our server stated was a light red wine. So I decided to take a chance on it. The 2005 Ascheri "do ut des" Verduno Pelaverga ($36) is from the Verduno Pelaverga DOC in the Piedmont region. It is made from the Pelaverga varietal, a rare though ancient Italian grape. There are actually two different grapes, the Pelaverga Piccolo and the Pelaverga Nero. There are only around 9 hectares of Pelaverga vineyards, almost all in the small town of Verduno. I had never tried this grape before so I was intrigued. This wine only had an alcohol content of 12.5%, a relatively lower alcohol wine compared to many others. The wine was very light red in color, lighter even than most Pinot Noir. Its nose seemed light at first, just a hint of berry. On the palate, this wine initially had a tartness to it that was a bit displeasing. But, as the wine sat for a time, and once we began to eat, the tartness largely vanished and we enjoyed the wine far more. So, I would suggest letting this wine breathe a bit first, as well as drinking it with food. With our dinner, the wine displayed more red berry flavors with touches of black pepper and licorice. Though it also had its own unique taste, more of an interesting blend of sweet and sour. This was a light wine though clearly not a Pinot Noir. I did enjoy this wine and would try other Pelaverga wines. If you want something different, give this a try. Service was excellent. Overall, this was another fine experience at Rendezvous. Great food, good quantities, reasonable prices. If you are in Central Square, this is the restaurant to seek out. I have mentioned before how Saké is part of many different ceremonies and rituals in Japan. Yet did you imagine that Saké is also part of a ritual involving alleged organized crime? A "sakazuki" is a small to medium-sized cup for drinking Saké and it used only for drinking Saké. As I discussed previously, it is traditional to share Saké at weddings performed in accordance with Shintoism. This custom is generally known as "sakazuki-goto." Yet Sakazuki-goto is not restricted to weddings. It is sometimes used by others to solidify their friendships or bonds. And one such group that uses this ritual is the Yakuza. The Yakuza, often labeled the "Japanese Mafia," are members of traditional organized crime groups. The origin of the Yakuza extends back hundreds of years and their exact origin is shrouded in mystery and dispute. The Yakuza adopted a traditional hierarchy of "oyabun-kobun." The kobun (literally translated as "foster child") owes their allegiance to the oyabun (literally translated as "foster parent"). This relationship was formalized by a sakazuki-goto, sharing of Saké from a single cup. The kobun would keep the sakazaki as a sign of their loyalty to the oyabun. Those who perform sakazuki-goto with the oyabun are considered to be part of the immediate family and thus ranked in terms of elder or younger brothers. The kobun may perform also the sakazuki-goto with their own underlings. This creates small, affiliated gangs, which have a lower overall ranking in the larger organization. Many Japanese Yakuza movies depict sakazuki-goto scenes. A sakazuki-goto is not limited to performance within a particular Yakuza organization. It can even be conducted to ally different Yakuza groups. OurGlass Wine Co. will be holding a Grand Winter Wine Tasting on Saturday, February 16, from 3-7pm. This free Tasting will probably include 50+ wines and maybe some beers as well. They run several of these Grand Tastings each year and they are always an excellent opportunity to taste some of the newest wines on the market. They always have a good diversity of wines available for tasting. There will also be some food to nibble upon as well as a discount on their wines. If you are not still hung over from the Boston Wine Expo the weekend before, then why not stop by. I will be leading a group of the North Shore Winers there so maybe I will see you there. The U.S. is now #2 in annual wine consumption, rising above Italy and nearing France which remains #1. But France's position is precarious and the U.S. should take its place within the near future. The Sierra Sun has a new article concerning U.S. wine consumption and it is well worth checking out. I am sure you will see similar articles this week in other magazines and newspapers. I previously discussed a similar article in the Houston Chronicle. The Sierra sun article repeats much from that previous article but does add some new information. What I found especially interesting about the article was the statistic on how much wine the average U.S. wine drinker imbibes. The annual average is 2.77 gallons of wine, the equivalent to about 14 regular-sized (750ml) bottles of wines. This is just a little bit more than one bottle per month. This is the average for "wine drinkers" so it does not seem to take into consideration those people who do not drink wine. I think it is safe to say that most wine bloggers are not average in this respect. We all probably drink far more than that in a single month. This statistic though obviously shows why the wine industry is so competitive. If the average person is only buying about one bottle of wine per month, then how does a wine producer get their product to be that one bottle? That is why you see so many animals on labels and other gimmicky wines. Anything to give a wine even the slightest edge over another. And if they can get some loyalty toward their product, they might be almost the only wine a consumer buys. A couple other important facts about wine buying includes that wines under $20 occupy the largest market share and that women buy more wine than men (which I have also discussed before). Maybe you cannot attend the wine dinner at Fleming's but still would like to meet Thomas Arvid. You will have another chance to meet you, at a different event. I have previously posted about the upcoming 17th Annual Boston Wine Expo on February 8-10. I wanted to update you about the special appearance of Thomas Arvid at the Expo. On February 9 & 10, from 1-5pm each day at the Expo, Dzian Gallery will present Thomas Arvid, a painter who specializes in art depicting wine and the rituals surrounding its consumption. Take a look at his website to see some of his work. He will be doing a book signing at the Expo. He might also have other items for sale, including his artwork, though I am not sure of that. So when you go to the Expo and take a break from tasting, to rest your palate, why not stop by Arvid's booth and check it out. I will likely stop by on Saturday afternoon so maybe I will see you there. On February 7, Fleming's Prime Steakhouse and Wine will be holding a wine dinner with special guest Thomas Arvid. There will be a Reception at 6pm and then dinner at 7pm. Dzian Gallery states: "Thomas Arvid continues to astonish both art and wine enthusiasts with his monumental compositions that capture the delicate beauty of wine and the evocative pleasure of its consumption. Achieving widespread success with his iconic portrayals of the wine experience, Arvid has become synonymous with the art of living graciously. As the foremost painter of American Realism, Arvid conveys in vivid detail one of the most enjoyable aspects of life - getting together with friends to enjoy good conversation over the perfect bottle of wine." Check out Arvid's website to see his intriguing wine pictures. And join him at Fleming's for a delicious sounding menu created by Chef/Partner Jason Carron. The wines are exceptional as well. I have been to Fleming's before and enjoyed the food very much. I have now posted the The Passwords: Part 6-The Finale on my A Passionate Foodie: Fiction blog. This is the final chapter in that story. Check it out and see what happens when the thugs confront Brian outside the hotel. Will he be killed? What will happen to the evidence? Can Brian outwit them? Just a reminder that I am holding a Sake Review contest this month. You can win two books on Sake and all you have to do to enter the contest is drink and review a bottle of Sake. Check out my prior post for all the details. Can you find Saké down under? Or is Shiraz all you will find? As I mentioned before, Japan is not the only country to produce Sake, though it certainly is the largest and most important producer. The United States has several Saké breweries. But where else is Saké made? Well there is one Saké brewery in Australia. In 1996, the Sun Masamune company, owned by Konishi Brewing Co. Ltd , constructed a Saké brewery at Penrith near Sydney. Konishi is a renowned brewery in Japan with over four hundred years of experience. The current Toji of Sun Masamune is Hirofumi Uchiyama, a well known specialist from Nada district of Japan. The brewery produces about 1 million liters of Saké each year. The vast majority of their Saké is exported to Japan, though some of their production is supposed to be exported to the U.S.
Their brand line is named "Go-Shu" and the two Japanese characters that make up that represent the words "Australian Saké" and phonetically translates as "Australia." Go-Shu Saké is brewed using pure water from the Blue Mountains and high quality Japonica rice grown in Australia. Their general style of Saké is Tanrei Karakuchi (which means "light and dry"), a style I enjoy very much. But they may start creating some other styles as well. Some of their products include: Go-Shu Premium Junmai Saké (semi-dry), Go-Shu Premium Nama Junmai Saké (semi-sweet), Go-Shu Blue Super Premium Junmai Ginjo Saké (medium-dry), Go-Rin Superior Australian Junmai Ginjo Saké (semi-sweet), and Go-Shu 40 Ultra Premium Junmai Dai Ginjo Saké (dry). They also make Tsunami, a Sparkling Saké Cocktail with Lychee & Muscat Flavor. It is a ready-to-drink cocktail with only a 4.5% alcohol content. I have not seen or tasted any of this Australian Saké yet but I am intrigued by it. The company obviously has much experience and skill in Saké brewing. But what would be the impact of Australian grown rice? I will keep an eye out for it. I love both Saké and Vodka so what would a blend of the two produce? Offhand, it seems like a winning combination. But what is the reality? Recently, while dining at Haru I tasted their Sakétini, a combination of Vodka, Saké and Plum wine. I enjoyed the Sakétini, the Saké and Vodka blending well. So there was some proof that I was correct. And now I have tested that combination once again. Would I find more support? Or would I find an unflattering mix? Wokka Saki is a new liquor, a combination of Vodka, Saké and Asian fruits. Tim Day created Wokka (Japanese for "vodka") Saki in 2002. He was inspired by the legendary Juhyo, or "snow monsters" of Mount Zao in Japan. Each year, between January and March, potent winds from the west, across the Siberian plains, blow across the Sea of Japan. The wind becomes heavy with frozen vapor before striking the coast and rising over the Asahi Mountains. Mount Zao is covered by many giant conifers and these winds bring much snow and ice which cover the trees. The shape of the trees is distorted by the snow and ice and they seem to resemble monsters. These are called Juhyo and there is even an annual "snow monster" festival. So for Wokka Saki, western wine (represented by the Vodka) thus meet the eastern environment (represented by the Saké). Tim Day sought out a master blender to help him create Wokka Saki. After about 500 attempts, they created Wokka Saki. Wokka Saki is a blend of micro-distilled British wheat vodka (80%), premium Honjozo Saké (20%), and a subtle flavor of Asian fruit. It is 80 proof, like most Vodkas. Day won't say which specific Asian fruits are added to the blend. Production takes place at the 200 year old Thames Distillery in London under the control of master distiller, Charles Maxwell. The Vodka is first microdistilled in a single, stainless steel pot still. This 400 liter pot still is known as "Tom Thumb." The Vodka is then blended with Saké and a bit of Asian fruit added. I bought a bottle of Wokka Saki at Astor Wines & Spirits in New York City. I placed the bottle in the freezer and took it out the other night to try it. The Wokka was thick and almost looked syrupy from having been in the freezer. It was a very smooth drink without any bite. There was a prominent taste of nectarine and a slighter tinge of maybe peach. Unlike some other flavored Vodkas, the fruit flavors were not overly sweet or cloying. Instead, you got the fruit flavors without a sugar rush. I really do not think you taste the Saké but then the Wokka is predominantly Vodka. But the addition of the Saké may actually serve to mellow the Vodka. This is probably one of the best flavored Vodkas I have had in sometime. It could be drank on the rocks, or combined into a cocktail. I am sure the flavor of the Wokka would complement many different cocktails. I enjoy the subdued fruit flavors, especially as they are not overly sweet. I recommend that you check out the Wokka Saki. You learn something new all the time. Timely, as this is Saké month on my blog, I read a recent article in the Mainichi Daily News about an interesting Japanese ceremony involving Saké and carp. Yes, the fish. And unlike my previous post talking about using sea creatures as drinking vessels, these carp have a far more important function. On January 7, in a tradition extending back to the Edo Period (1603-1868 A.D.), a ceremony was held in which carp were fed Saké to symbolically take on people's calamities. Once the carp have drank the Saké, they are released back into a river. It seems similar to something like a scapegoat. Those participating in the ceremony were of certain ages thought to be prone to calamities, of ages 25 and 42 for men and ages 19 and 33 for women. Anyone care to feed a cod some Cabernet? NE Aquarium "Celebrate Seafood Dinners"